Running so hard you think you'll choke on your next breath. Lungs burning like they're drenched in battery acid. Peripheral vision blurred by the same adrenaline that drowns out the cheers coming from the full stadium. And of course, the reporters. The men scribbling furiously on their notepads so they can publish every stumble, sprain, and sniffle in these historic games. This was the world of the female athletes in the 1928 Amsterdam Olympics, the first games in which women were allowed to compete in track and field (and on a trial basis, at that). Nicknamed "the Peerless Four," the Canadian track team included some of the strongest and most diversely talented women on the scene. Narrated by the team's chaperone--a former runner herself--the women embark on their journey with the same golden goals as every other Olympian, male or female. But as the Olympic tension begins to rise with unexpected injuries, heartbreaking disqualifications, and the pressure of supreme athletic performance, each woman discovers new fears and new priorities, all while the weight of women's future in the Olympics rests on their performance. 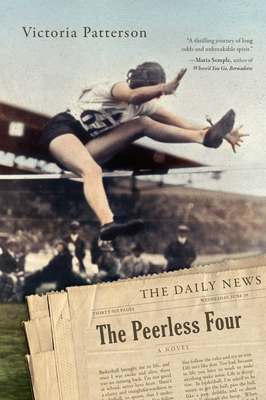 The Peerless Four is more than a sports novel, more than a record of how far women's rights have come in the past 75 years. It's a meditation on sacrifice, loyalty, commitment, perseverance, and the courage to live a true underdog tale. Victoria Patterson is the author of This Vacant Paradise, which was a 2011 New York Times Book Review Editors' Choice. Her work has appeared in various publications and journals, including the Los Angeles Times, Orange Coast Magazine, Alaska Quarterly Review, and The Southern Review. She lives with her family in Southern California and teaches through the UCLA Extension Writers' Program and as a visiting assistant professor at UC Riverside.